A satellite view of the recent build up on Woody Island. Chinese Foreign Minister Wang Yi said Wednesday that the reports of the missile deployment are the creations of some Western media. China has deployed an advanced surface-to-air missile system to one of the disputed islands it has claimed in the South China Sea, a move that is likely to increase tensions among China and its neighbors. Officials in Taiwan and the United States say China has deployed surface to air missiles on a disputed island Beijing controls in the South China Sea. The confirmation comes just as President Barack Obama wraps up a landmark summit with Southeast Asian leaders in California, where he urged restraint in the region and a halt to the militarization of disputed maritime areas. News of the deployment was first reported by American broadcaster Fox News, which based its report on images provided by a civilian satellite company ImageSat International. According to the report, the images show two batteries of eight surface-to-air missile launchers, as well as a radar system deployed on Woody Island. A U.S. defense official later confirmed the deployment, as did Taiwan’s Defense Ministry spokesman Major General David Lo. Woody Island (or Yongxing Island as it is known in Chinese and Phu Lam in Vietnamese) is the largest of the Paracel Islands and is located in the northernmost part of the South China Sea, east of the central Vietnamese city of Da Nang. Woody Island has been under China’s control since 1956, and is a prefecture level city of the southern Chinese province of Hainan. The island is also claimed by Vietnam and Taiwan. China’s Foreign Minister Wang Yi told reporters Wednesday that Western media should pay more attention to the lighthouses and meteorological facilities China is building in the South China Sea. Wang did note what he called China’s right to limited and necessary self-defense facilities on its islands and reefs. "This is consistent to self-preservation and self-protection that China is entitled to under international law. So there should be no question about that," Wang said. 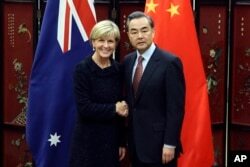 Australian Foreign Minister Julie Bishop, left, and Chinese Foreign Minister Wang Yi pose for photographers as she arrives for a meeting at the Ministry of Foreign Affairs in Beijing, Wednesday, Feb. 17, 2016. China’s claim to almost all of the South China Sea and massive reclamation of formations further south has been a growing source of concern among its neighbors in the region, even as Beijing works feverishly to expand trade ties. In recent years, China has beefed up efforts to build runways and artificial islands to bolster its territorial claims. Beijing has repeatedly said that it does not seek to militarize the South China Sea, but it has increasingly voiced concerns about U.S. freedom of navigation missions in the region, at sea and in the air. Alexander Huang, an assistant professor at Taiwan’s Tamkang University, said the deployment was sending a telling, albeit contradictory signal about China’s future intentions in the South China Sea. “China is under tremendous pressure right now with the conference in Sunnylands and the U.S.-[South] Korean discussion over the THAAD deployment,” he added. Still, how the United States and ASEAN countries may respond is unclear. While ASEAN countries may genuinely want closer ties with the United States, they are also heavily and increasingly reliant on booming trade with China. And if the United States wishes to respond, the tougher question is what could Washington do to get China to change its behavior. Freedom of navigation actions by the U.S. Navy have not made Beijing to change its behavior, noted Ross Darrell Feingold, a Taipei-based senior advisor at DC International Advisory, a political risk consultancy. Perhaps more important is what the action says about China’s ability to manage significant issues simultaneously, Feingold added. “There is the aftermath of the North Korea missile test and nuclear test, the ASEAN Summit, significant political change in Taiwan, ongoing domestic challenges – economy, corruption investigations –yet the Chinese leadership remains confident it can, at the same time, manage the international reaction to its missile deployment,” he said.